With over 50+ combined years of expertise in the information technology and data collection industries, Sport-TAG has provided racing industries with cutting edge technology for race timing and scoring paralleled with unrivaled customer support and assistance. In the early 1990s, Sport-TAG partner Kirk Sessions pioneered one of the very first automated scoring system using a portable batch bar code scanner. A bar code label was placed on each racers helmet that would be scanned each time they passed through the start/finish line. This scan would capture the racer's number and an associated timestamp. The data would then be uploaded from the scanner to a computer running a Microsoft DOS software scoring system. Sport-TAG's next leap in technology came in the late 1990s with the use of a real-time wireless bar code scanner that would again capture the racer's number and associated timestamp to be automatically uploaded into a Microsoft Windows scoring system. This was the first "real-time" scoring system that eventually lead to "Live Results" and was a very successful scoring system for several years. As RFID technology gained momentum in retail markets, Sport-TAG began testing with passive RFID technology in 2005. 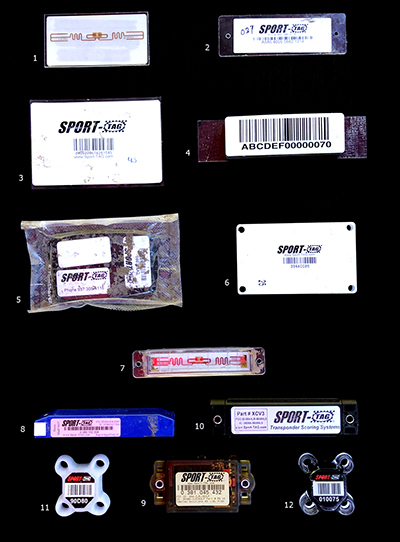 After extensive race testing of many different passive RFID labels ad reader systems, Sport-TAG found that weather conditions (rain and mud) combined with motorized sports issues (metal on bikes and metalized helmet paints) created issues with reading the passive RFID labels resulting in read-rates of less than 98%. Other factors, such as multiple racers crossing the finish line at one time made it difficult to capture the correct order in which each racer crossed the start/finish line which continues to be an issue with such passive systems today. As a result, Sport-TAG transitioned to race testing active transponder systems in 2006 which led to the development of their first active system in 2007 which is still in use as part of Sport-TAG's solidly built and proven legacy system. SportTAG is committed to keeping up with industry advancements and the latest technologies in order to provide fresh and innovative solutions to customers. After two years of research and development of several emerging technologies, Sport-TAG was proud to announce their new state-of-the-art V4 race timing and scoring system in 2018. You can depend on Sport-TAG to be committed to your best interests in mind. Sport-TAG strives toward a future of continued success and growth through participation in customers' successes.